In keeping with last week's theme of "things I don't usually make," molecular gastronomy, or anything that involves clouds of vapors swirling throughout my kitchen, also falls in this category. So when the NYTimes ran an article on Nathan Myhrvold's six volume tome on Modernist Cuisine, I was skeptical. Plus, I'm an Apple girl, not Windows. Anyway, the Times feature was surprisingly approachable, the salmon looked delicious and called for nothing more than a thermometer by way of gadgets. Basically what you do is place the salmon fillets in ziplock bags and place them in a bath of very hot tap water. 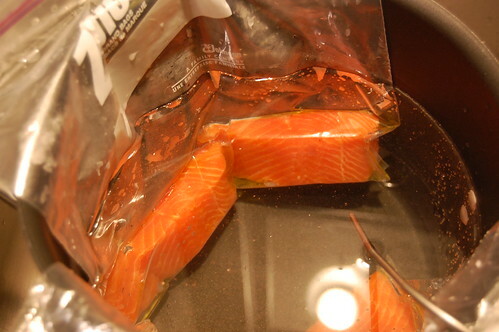 The weight of the water creates a vacuum seal in the bags, and the salmon cannot over cook since it will never go above the temperature of the water. To finish it off, you very quickly sear the salmon in some spice butter for flavor (you want to get a bit of crisp on the outside but be sure not to cook the inside any further). The salmon is amazing - nothing like that over cooked baked salmon that smells up your house, and it has become my go-to technique for salmon at home. The spice butter can really be anything you'd like - I bet a curry mixture or a Moroccan tagine spice mix or za'atar would be great. But for this one I chose dukkah, which is an Egyptian spice blend based on hazlenuts, coriander, and pepper. Dukkah can be used for all sorts of things, from a dipping sauce to a crust for beef, but it is definitely for the coriander lover. But play around with the spice blend to your taste, making salmon with hot tap water was never easier. The quantity of salmon here doesn't really matter- use as many or as few sliced fillet pieces as you like. Adapted from the New York Times. 1. For dukkah: toast hazelnuts in a dry skillet. Add to a food processor with the remaining ingredients and process until coarsely ground. This can also be done in a mortar and pestle but I find the peppercorns don't break up as well that way. 2. Season the fish with salt and pepper. Place a large pot in your sink, and add warm water until the pot is full and the water reaches 115 degrees. Place two fillets side by side in a gallon-size heavy-duty resealable plastic bag. Drizzle fillets with oil. Submerge the bags halfway into the warm water (this creates a vacuum). Seal as airtight as possible, pushing out any excess air. Repeat with the remaining fillets. 3. Once all the salmon fillets are submerged in the pot, add more hot water until the water temperature returns to 115 degrees (the cold fish will reduce the water temperature). Let the salmon rest in the water bath about 20 to 25 minutes. Check the water temperature occasionally and add more hot water as needed to maintain the temperature of 115 degrees. (If you want to check, the salmon's internal temperature should reach 113 degrees, but I didn't find it necessary to check). 4. Remove fish from plastic bags and peel off skin. 5. 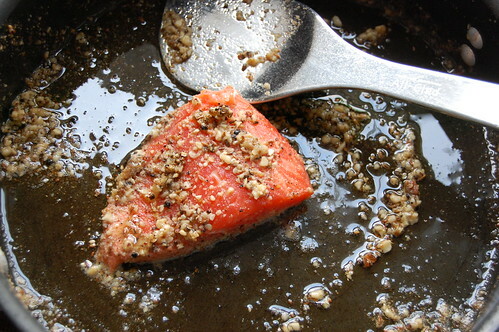 Melt the 8 tablespoons butter in a skillet and add in the dukkah mixture. Make sure your pan is nice and hot before adding the salmon (the butter will be bubbling). Saute in the salmon fillets on both side, basting with spice butter the whole time, about 30 seconds each side. Serve immediately.